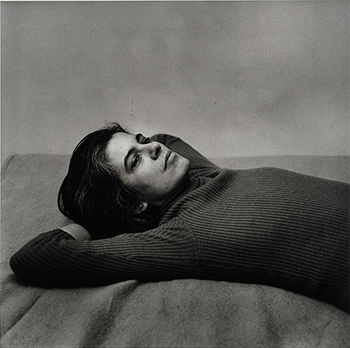 Chromongenic print, image 10" x 13"
Gelatin silver print, 14-3/4 x 14-3/4 in. $6 senior citizens (65 and older) and Ohio State faculty and staff (with BUCK ID). All visitors are admitted to the exhibitions for free on Thursdays after 4 PM and on the first Sunday of each month. Heirloom, the center's café, features local and seasonal ingredients, creatively prepared, including breakfast dishes (served all day), soups, salads, sandwiches, entrees, and baked goods, plus coffee from Crimson Cup. The hours listed above are for the onsite Wexner Center Store, located on the lower level. Visit the Wexner Center's online store anytime. The Wexner Center for the Arts is The Ohio State University's multidisciplinary, international laboratory for the exploration and advancement of contemporary art. Through exhibitions, screenings, performances, artist residencies, and educational programs, the Wexner Center acts as a forum where established and emerging artists can test ideas and where diverse audiences can participate in cultural experiences that enhance understanding of the art of our time. In its programs, the Wexner Center balances a commitment to experimentation with a commitment to traditions of innovation and affirms the university's mission of education, research, and community service. In October 2005, the Wexner Center galleries reopened after an extensive renovation. All program areas remained active during the renovation, but exhibitions were mounted off site, at the Belmont Building in downtown Columbus. The Wexner Center building is named in honor of Harry L. Wexner, the father of Leslie H. Wexner, chairman and founder of Limited Brands and a major donor to the center. The galleries are located on the lower level of the Wexner Center building. The galleries are always closed on Mondays and also closed between exhibitions. Since opening in 1989, the Wexner Center has attracted international acclaim for its innovative architecture and well-equipped facilities, as well as its bold artistic programs. 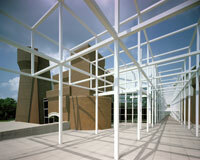 Designed by architects Peter Eisenman and Richard Trott, the Wexner Center building houses four exhibition galleries (totaling approximately 13,000 square feet), an intimate video exhibition space called "The Box"; the Film/Video Theater; and the Performance Space, a "black box" theater with flexible seating. Also on site are Wexner Center offices and the Film/Video Studio, a state-of-the-art video postproduction studio. Mershon Auditorium, adjacent to the Wexner Center building, features a large multipurpose auditorium/theater, as well as complete front-of-house and back-of-house facilities and administrative spaces. The Wexner Center also presents events at several other venues on campus. These include Weigel Auditorium, a 800-seat concert hall administered by Ohio State's School of Music, and Thurber Theatre at Drake Performance and Event Center, a mid-sized proscenium theater administered by Ohio State's Department of Theatre. 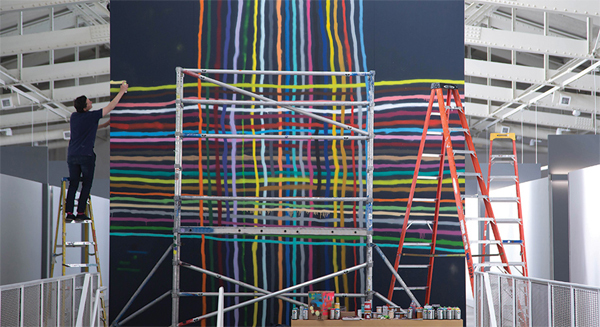 In addition to hosting events on campus, the Wexner Center, also, presents work at venues throughout Columbus. Ohio State's Fine Arts Library is located on the lower level of the Wexner Center building; the entrance is from the outdoor walkway under the Wexner Center's grid and can be found just south of the 17th Avenue Plaza.